6pm Bearpaw Kids Footwear RP 682Y - Heel height of 1. 00 inches Shearling lined. Girl's bearpaw, abigail wool lined boots she?ll enjoy this classic style this fall! Suede upper Pull on style for an easy on and off Soft wool blend lining Sheepskin covered cushioned footbed for added comfort 5 3/4 inch boot shaft height with a 5 inch opening 1 inch heel with a rubber outsole. 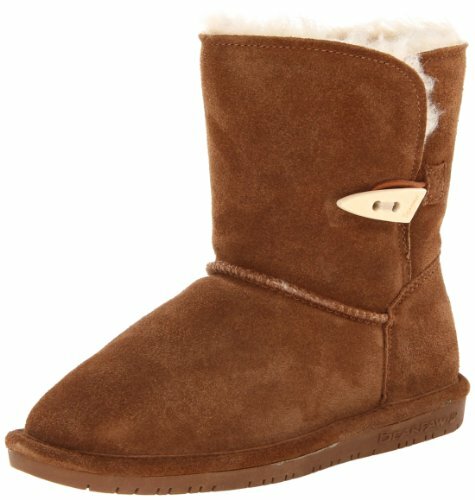 BEARPAW 608T - Suede pull on boot with blended wool shaft. Sheepskin footbed. Flexible sole. Non-marking outsole. BEARPAW 608TZ - Non-marking outsole. Suede boot with side zipper for each entry Sheepskin footbed. Non-marking outsole. Sheepskin footbed. Flexible sole. Flexible sole. BEARPAW EMMA - K - Sheepskin footbed. This classic shearling boot from BEARPAW features a comfy fit and on-point style. Flexible sole. Sheepskin footbed. Sheepskin footbed. This classic shearling boot from BEARPAW features a comfy fit and on-point style. Faux Fur. Flexible sole. Non-marking outsole. Shearling lined. Non-marking outsole. BEARPAW 1653W - Woven heel logo. The adorable rosie, with the new single toggle closure, is a must-have addition to your Bearpaw boot collection. Shaft measures approximately 6. 5" from arch. Sheepskin footbed. Non-marking outsole. Rosie rocks! 7" tall. Classic low profile TPR outsole. Sheepskin footbed. With a closed toe. Non-marking outsole. Flexible sole. Cow suede upper. Sheepskin footbed. As always, you can count on the wool blend lining for warmth and the sheepskin footbed for cushioning and comfort. Open lateral side with single toggle closure. Sheepskin and wool blend lining. Shearling lined. Sheepskin footbed. This classic shearling boot from BEARPAW features a comfy fit and on-point style. BEARPAW Women's Rosie Winter Boot Blue - Faux Fur. Flexible sole. Single toggle closure. BEARPAW 682T - Sheepskin footbed. Shearling lined. Flexible sole. Flexible sole. Shaft measures approximately 6. 5" from arch. Single toggle closure. Suede pull on boot with blended wool shaft. Non-marking outsole. Sheepskin footbed. Sheepskin footbed. Non-marking outsole. Non-marking outsole. With a closed toe. Flexible sole. Rubber sole. Sheepskin footbed.
. This classic shearling boot from BEARPAW features a comfy fit and on-point style. Faux Fur. BEARPAW Emma Short - Non-marking outsole. Sheepskin footbed. Sheepskin footbed. The upper is made of soft suede for a natural look, and the boot€s luxuriously cozy lining provides increased cushioning and all-over comfort. Shearling lined. Non-marking outsole. Non-marking outsole. Flexible non-marking outsole. This classic shearling boot from BEARPAW features a comfy fit and on-point style. Faux Fur. Flexible sole. Sheepskin footbed. Rubber sole. Flexible sole. Sheepskin footbed. With a closed toe. This short-height women's boot by offers a style that's well paired with denim, a casual skirt, or country dress, with a ruggedly comfortable design ideal for kicking around town. Single toggle closure. Round toe. Bearpaw Women's Emma Short Snow Boot - Shaft measures approximately 6. 5" from arch. Classic pull-on boot in mid-height featuring pinched seaming and fur lining. Flexible sole. 6pm Bearpaw Kids Footwear RP EMMA TALL YOUTH - K - Sheepskin footbed. With a closed toe. Non-marking outsole. Flexible sole. Flexible sole. Shearling lined. The emma's smooth suede upper contains a comfy lining that keeps her foot warm and dry. Classic pull-on boot in mid-height featuring pinched seaming and fur lining. Shaft measures approximately 6. 5" from arch. Non-marking outsole. Single toggle closure. Give her a grown-up look with this boot from BEARPAW. The flexible, non-marking rubber sole offers your little one improved traction on wet surfaces. This classic shearling boot from BEARPAW features a comfy fit and on-point style. Faux Fur. Flexible non-marking outsole. Sheepskin footbed. Round toe. BEARPAW Emma Tall Youth Boot - Sheepskin footbed. Non-marking outsole. Sheepskin footbed. Flexible sole. BEARPAW 1653Y - Flexible sole. Flexible sole. 6 inch Sheepskin footbed. Classic pull-on boot in mid-height featuring pinched seaming and fur lining. Flexible non-marking outsole. Round toe. Flexible non-marking outsole. This classic shearling boot from BEARPAW features a comfy fit and on-point style. Faux Fur. Rubber sole. Flexible sole.
. Non-marking outsole. Flexible sole. Sheepskin foot bed. Sheepskin footbed. Single toggle closure. Non-marking outsole. With a closed toe. Sheepskin footbed. Tall boot featuring logoed counter and outsole. Sheepskin footbed. Shaft measures approximately 6. 5" from arch. Shearling lined. Non-marking outsole. BEARPAW Abigail - Flexible sole. Round toe. Faux Fur. Single toggle closure. 8 inch double toggle boot Sheepskin footbed. Sheepskin footbed. Non-marking outsole. Shaft measures approximately 6. 5" from arch. Non-marking outsole. Flexible non-marking outsole. Flexible sole. This classic shearling boot from BEARPAW features a comfy fit and on-point style. Faux Fur. Rubber sole. Sheepskin footbed. Flexible sole. With a closed toe. Flexible non-marking outsole. Sheepskin footbed. Flexible sole. Flexible sole^Non-marking outsole. Shearling lined. Classic pull-on boot in mid-height featuring pinched seaming and fur lining. Non-marking outsole. Sheepskin foot bed. Tall boot featuring logoed counter and outsole. Bearpaw Kids BP-2062Y - Faux Fur. Flexible non-marking outsole. Non-marking outsole. Round toe. Sheepskin footbed. Fashion v shaped top collar opening. Sheepskin footbed. Tall boot featuring logoed counter and outsole. This classic shearling boot from BEARPAW features a comfy fit and on-point style. Faux Fur. Flexible sole. Material: Suede, Wool, Sheepskin. Sheepskin footbed. Flexible sole^Non-marking outsole. Non-marking outsole. Flexible sole. Sheepskin foot bed. 6 inches tall. Flexible non-marking outsole. With a closed toe. Rubber sole. Cow suede upper. Adorned with a fringed back tie detail and a fashion v-shaped top collar opening. Shaft measures approximately 6. 5" from arch. BEARPAW Kid's Mia Boots, Suede, Wool, Sheepskin - Flexible sole. Non-marking outsole.